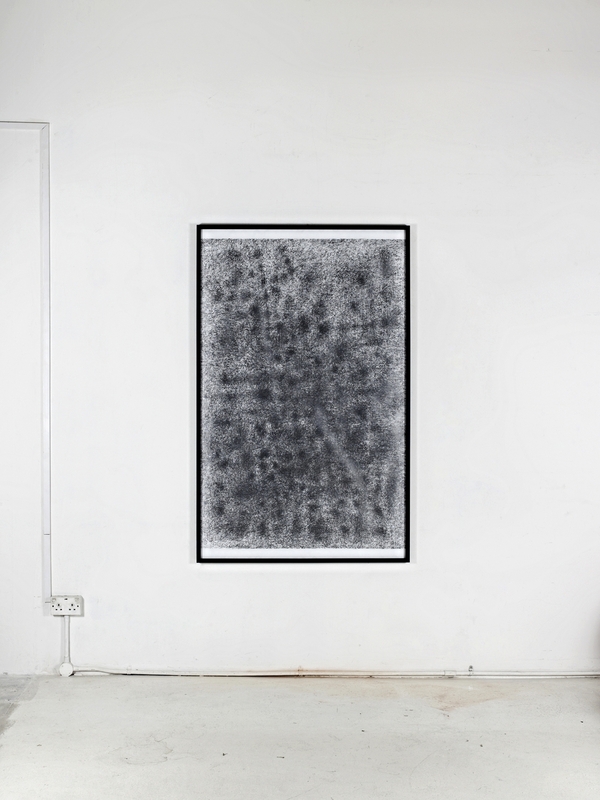 The work was made by forcefully and repeatedly pounding graphite rods all over the surface, applying layers of graphite marks towards a composition. Widjaja intensified the physical demands of this process by applying his entire body, exerting its full weight onto the paper, both arms pounding, subjecting himself to the noise, heat, and exertion from the act. Held in the artist’s hand, the carbon-based graphite becomes an extension of the artist’s carbon-based corpus. There is no longer any medium, and the artist applies himself directly onto the surface. There is perfect causality between his movements and the markings of the graphite on the paper. In this act, the artist is making literal physical impressions, not symbols. The city is a high energy space, but urban living is largely an intellectual act. Physical exertion, if any, is compacted into short, intense bursts, like workouts at the gym. Energy absorbed from the city accumulates in the physically passive body, and needs to be expended. This artistic process is a physical catharsis, and the artist desires to experience and record his own corporeality.